I moved here from a city whose outlying municipalities have pretty strict rules about what can and cannot be built and, furthermore, how the built environment is maintained over time (see footnote). Those rules are in place not only for the health, safety and welfare of citizens but in small part, to help maintain property values in neighborhoods. So, as a (former) midwestern property owner, it should come as no surprise that I pay attention to the number of blighted properties in my neighborhood and eagerly follow the construction of houses, like the one pictured above. That said, I’m reasonably certain this house would not have received a building permit where I come from, let alone a certificate of occupancy, for its lack of windows, alone. 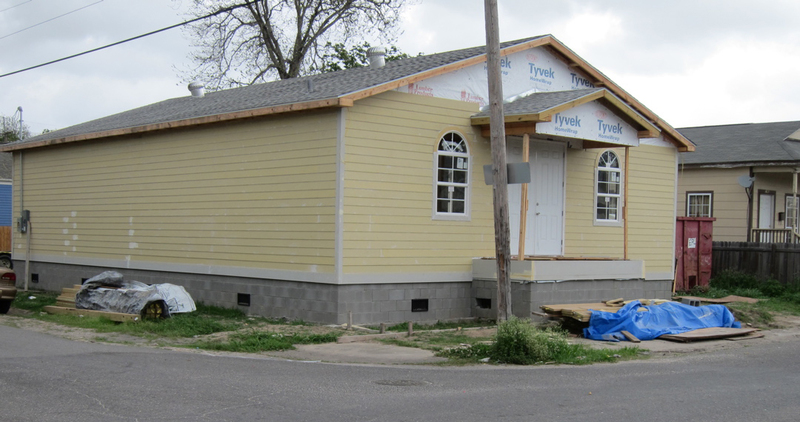 Also, you’ll note that the installation of siding is not complete on this house under construction: I can tell you from personal observation that it has not been complete for some time. Is that cause for concern? Probably not… unless you live in the community of Burnsville, Minnsota, where failure to finish installation of your siding can land you in prison! I’m not kidding (nor am I suggesting that it makes sense). This prompted me to look into the property maintenance requirements for New Orleans. Not surprisingly,my search came up relatively empty. However, I did find an interesting research study noting the creation of the Office of Recovery and Development Administration (ORDA) and the City’s relative lack of code and ordinance enforcement when it comes to property maintenance. Should I be calling the authorities? (Ha, this time, I’m kidding). In a city whose streets ﬂood after a 20 minute downpour, I found this very hard to believe. 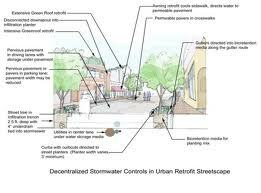 I now realize I’ve taken for granted the very progressive nature of the city I lived in for 13 years that requires a civil engineer to calculate rainfall percentages and a landscape architect to accommodate on-site retention of storm water. 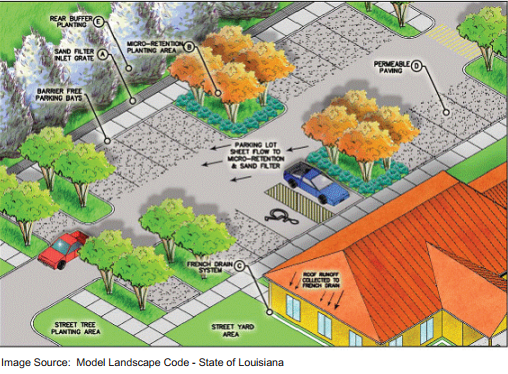 I realize the same approaches to stormwater management won’t hold true in an area with a high water table such as New Orleans but I’d thought I’d share this diagram from the Water Environment Research Foundation to get the ball rolling instead of… well… ﬂoating! Imagine my surprise when, after 13 years of living in Minnesota and being told that a handrail needs to be an inch and a half away from a wall, I learned that the Louisiana State ﬁre marshal not only enforces accessibility AND life safety but requires the handrail to be two and a quarter inches away from the wall! 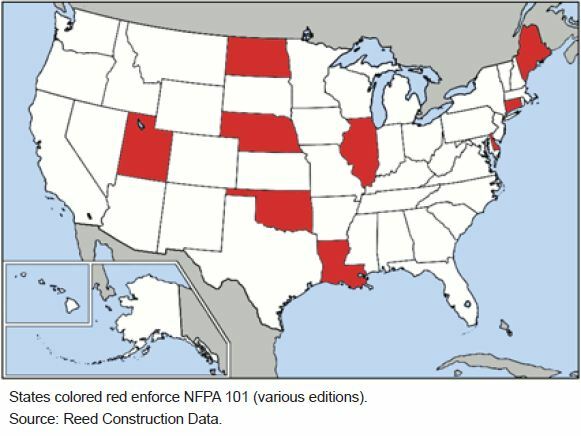 Amidst my amazement that a State enforced something other than the series of International [insert trade here] Codes with its own series of amendments, I decided to ﬁnd out who else has adopted the NFPA 101 as its life safety code. Turns out, not that many do and with no particular regional bent (see map below). 7.2.2.4.4.5 New handrails shall be installed to provide a clearance of not less than 2 ¼ in. (57 mm) between the handrail and the wall to which it is fastened. Commentary: In earlier editions of the Code, a minimum 1 ½ in. (38 mm) clearance was required between a new handrail and the wall to which it was fastened. The current provision, as detailed in 7.2.2.3.3.4, increases the required minimum clearance to 2 ¼ in. (57 mm) for new handrails in recognition of the fact that 1 ½ in. (38 mm) is an inadequate clearance for both a normal grasp and an emergency grasp of the handrail.